My guest this month is Hillary Morris of Nest Family Learning. Listen in as Hillary tells us about the incredible value available in the Nest Family Learning Animated Stories from the Bible series. View the Nest Family Learning product line by visiting their website at http://www.nestlearning.com. Watch the video below to see what other parents are saying about Nest Family Learning's Animated Stories of the Bible. Are you looking for a great way to share the Easter Story with your children? 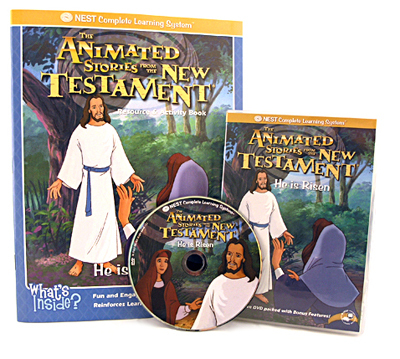 Enter our contest to register to win a complimentary copy of Nest Family Learning's "He is Risen" Interactive DVD with a 60+ page Bible Activity and Resource Book. Get all the details on our contest page.